We’d love your help. Let us know what’s wrong with this preview of Being Alive by Neil Astley. This poetry collection is the sequel to 'Staying Alive'. To ask other readers questions about Being Alive, please sign up. 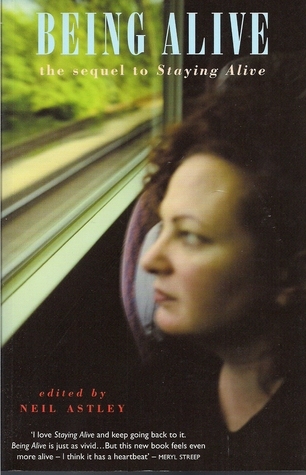 Being Alive, published in 2004, is a huge anthology of contemporary poetry. It is the second in the three compilations edited by Neil Astley: the first is entitled "Staying Alive" and the third, from 2011, "Being Human". The three books form a trilogy. Neil Astley has also now selected 100 poems from the entire collection of 1500, as a "'Staying Alive' travel companion". Just as with "Staying Alive", Being Alive is almost a reference book, in that it provides a first glimpse at so many poets. Nei Being Alive, published in 2004, is a huge anthology of contemporary poetry. It is the second in the three compilations edited by Neil Astley: the first is entitled "Staying Alive" and the third, from 2011, "Being Human". The three books form a trilogy. Neil Astley has also now selected 100 poems from the entire collection of 1500, as a "'Staying Alive' travel companion". "Being Alive" takes its readers on a journey through the world of contemporary poetry, stopping off for encounters and meetings." "I had no thought then of a sequel, but I also had no idea that the book would be championed so enthusisastically that readers would want a companion anthology." In fact "Staying Alive" became Britain's most popular poetry book within a fortnight of its publication in 2002. Being Alive uses the same format as its predecessor, containing perhaps 500 poems, this time divided into 10 sections. These sections are entitled: "Exploring the World, Taste and See, Family, Love Life, Men and Women, Being and Loss, Daily Round, Lives, Mad World, and Ends and Beginnings". Almost 300 poets' works are represented here. The different stances taken by each poet, means that a reader may be able to access those which best match their experience or world view, or if you like, those which "speak" to them. Neil Astley says that his introduction to modern poetry came in the 1960's, just as my own did, with the Liverpool poets' "Mersey Sound". Yet the research he did, as the editor and founder of the publishing company, "Bloodaxe books", revealed that most people view modern poetry as irrelevant or incomprehensible. He also discovered that only a startling 5% of poetry books sold in British bookshops were by living poets. Neil Astley states that as a result of "Staying Alive", many readers had expressed an interest in poets largely unknown to British readers, for example, Mary Oliver of the USA and Alden Nowlan of Canada. "Bloodaxe books" has subsequently published separate single editions of works by these and other poets, in their "Bloodaxe World Poets" series. Earlier in the introduction he had referred to the "access to international poetry restricted by the narrowness of British publishing". He invited suggestions for the upcoming third part of the trilogy. There is an index at the back, of titles and first lines, preceded by a useful alphabetical list of the poets included. As with the first book, each section is preceded by a brief introduction, and the list of poems included is by page number at the front. Once again, all the poems deal with life in a contemporary setting, and are poems which relate to some aspect of human experience, but remind the reader of eternal truths. They are chosen for their accessibility. The collection may be useful to a beginner to reading poetry, or someone who is about to study the area, and wanting to get an overview of modern poetry. For those mildly interested in the area, it could be one to dip into. However I have the same reservations as I have with the first book. It is a physically large and cumbersome book, with tiny print which is not particularly attractive. I find the darting around from one poet to another, with a very different world view, distracting. The result is a hotchpotch of unconnected thoughts. Because of this, it is not the sort of book to read through from start to finish, yet in no way is is a coffee table book either. Noble though the original idea is, and popular though it seems to be given the ratings, I feel this book is probably often selected as a gift, but never read and rarely consulted. However I am now interested to look at the books of single poets' selected works, from the "Bloodaxe World Poets" series. Ditto my review of the first anthology "Staying Alive". Another excellent sampling of poems. attesting to the nature of the struggle. It's impossible to tell how many of the poems here I missed, as I didn't read it front to back, so I hesitate to shelve this as finished. I will probably loan it again. Great poetry collection. With a little bit of everything inside. For some reason the star rating system has disappeared. I awarded the book 4 stars. I really enjoyed this book. I am not enamoured with poetry anthologies built around some 'theme' - in this case life and it's developing stages. It seems a little synthetic to me. Is not all poetry about life? Anyway not a big deal. Most of the chosen poems and poets I thought to be excellent and I was often surprised, in a good way, about the innovative approaches taken to structure and language by some poets. I f For some reason the star rating system has disappeared. I awarded the book 4 stars. This book is one of the best poetry collections that I have ever read. The editor Neil Astley in his introduction states he wanted to bring together poetry which "speaks to us with the same unnerving power now as when we first came across them". This book includes some of the best poems by the great poets of recent history like Yeats, Frost, Kavanagh, Heaney, Auden etc. but also includes works which English speakers will not know such as the translated works of Polish, Hungarian and Swedish poets This book is one of the best poetry collections that I have ever read. The editor Neil Astley in his introduction states he wanted to bring together poetry which "speaks to us with the same unnerving power now as when we first came across them". This book includes some of the best poems by the great poets of recent history like Yeats, Frost, Kavanagh, Heaney, Auden etc. but also includes works which English speakers will not know such as the translated works of Polish, Hungarian and Swedish poets. This is an excellent book for both beginners (especially IMO) and for those who enjoy poetry - there is a wonderful mix of known and unknown contemporary poets, divided into sections such as "War and Peace". Neil Astley didn't just pick wonderful poems but laid them out juxtaposing opposite tones of the same theme side by side. Adding this one in as a 'read' book as I am currently reading the third of this excellent series of poetry anthologies 'Being Human'. This is the strongest of the three in my view. All of the books make an effort to introduce the reader to new poets (which it certainly does). If there is a thematic link it is around poetry as a talismanic and life-protectingforce:text as touchstone. I do not know if I view poetry in quite this way but I am sure many people do. In any case the selection is excellent Adding this one in as a 'read' book as I am currently reading the third of this excellent series of poetry anthologies 'Being Human'. A good fat anthology of poems I was given to read for my book group, but which I wasn't able to find a suitable way to consume. I dipped in and out, read just under half (the poems are gathered into themed chapters) and enjoyed quite a few of what I read, but much of it barely made an impact - which I suppose is the nature of the format/genre. Nevertheless, had I owned rather than borrowed this, I would have dipped in and out over a longer period and got more from it. This is a companion to Staying Alive: Real Poems for Unreal Times. It's a similar collection, with a range of themes and different poets. A pretty diverse collection. I haven't read every poem in it, but I love the fact that I can dip in and out of it and almost always find something I want. I think these two anthologies will be staying with me. Why does It astonish me that there are so many good poems in here? The selection includes poems that are touching, chilling and funny. Some in translation, some by native English writers. I think Neil Astley, the editor, is a genius. If I had to recommend only one poetry book, this would be it. There's something for everyone, for every moment, from some of the best writers in the world. Lives on my bedside locker, I love this book. More great poetry. Read a poem a day - it's good for you. Oh and listen to Beethoven too - life changing.